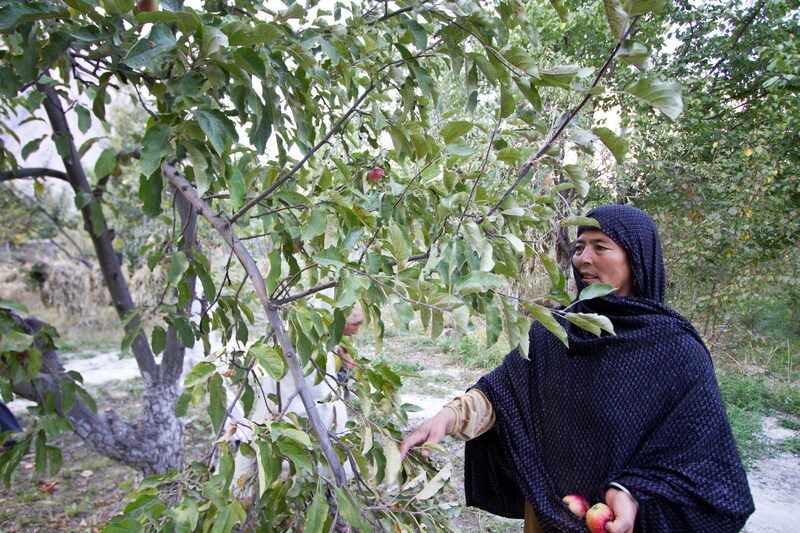 Hameeda from Shagricalan gamba has 25 trees of apricots and apples at her house. She works on harvesting the fruit with good quality and then to sell them in the market. 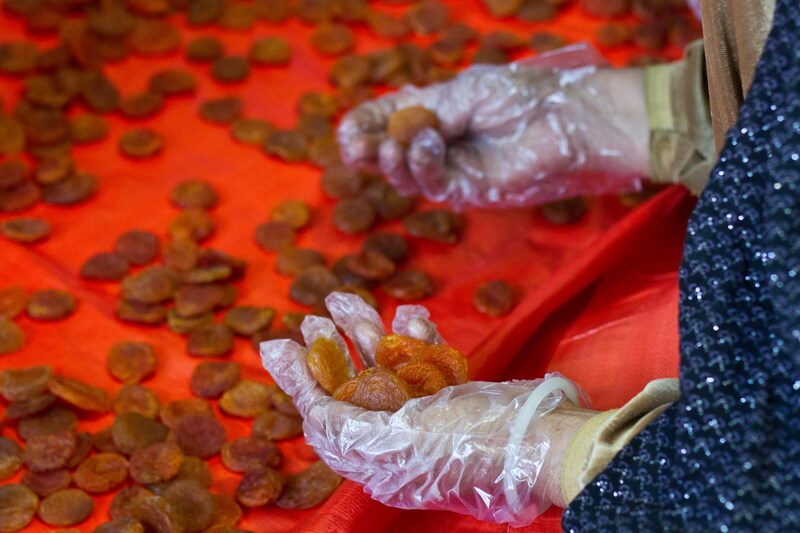 Dried apricots are now sold in markets across Pakistan and internationally. 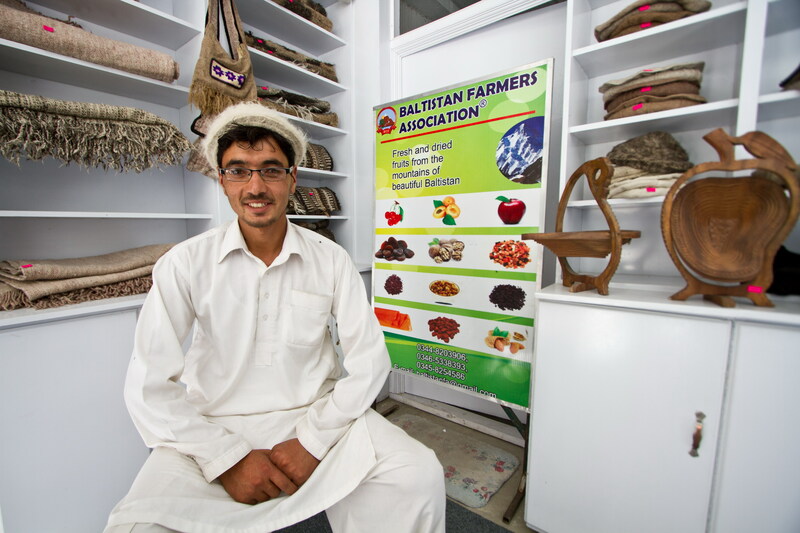 Shabeer Hussain is a sales man at the display center of Baltistan Farmers Association, Skardu, Gilgit-Baltistan.The shop sells local products by young men and women entrepreneurs from Baltistan. Aga Khan Rural Support Programme (AKRSP), Gilgit-Baltistan, Pakistan. AKRSP is responsible for installing hundreds of mini-hydels, the creation of thousands of savings groups, the reclamation and cultivation of hundreds of hectares of degraded land and the mobilisation of almost 5,000 community organisations. 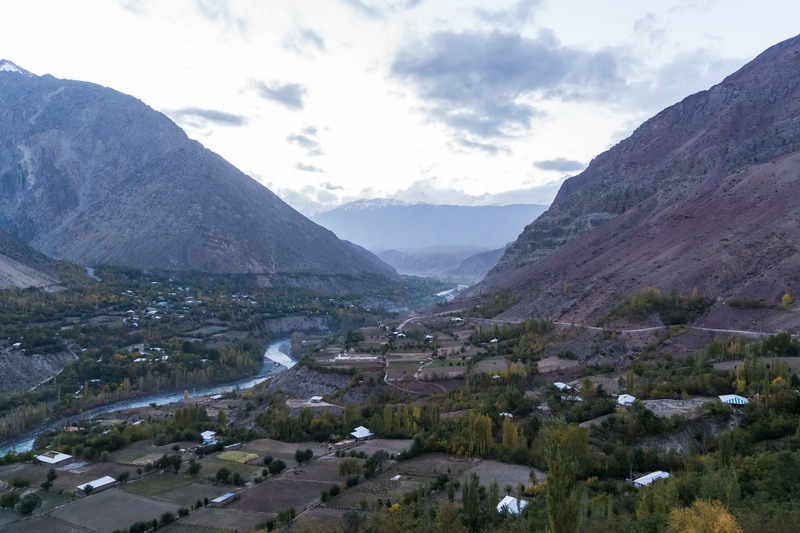 In 1982, when the first Aga Khan Rural Support Programme (AKRSP) was started in Gilgit-Baltistan and Chitral, the rugged region was one of the poorest areas in the developing world. Isolated and bypassed by advancements elsewhere, these rural communities of different ethnic and religious backgrounds struggled to eke out a meagre living, farming small holdings in the harsh environment of this mountainous desert ecosystem. The 1.3 million people in the AKRSP programme area lived in small villages widely dispersed throughout an area covering almost 90,000 square kilometres, an area larger than Ireland. AKRSP’s challenge over the last 36 years has been to create inclusive processes of development that diverse communities could participate in and sustain. Notable achievements include a significant increase in incomes (AKRSP contributed to the doubling of farm incomes in Gilgit-Baltistan and Chitral between 2001 and 2008), the construction of hundreds of bridges, irrigation channels and small infrastructure projects, and the planting of tens of millions of trees. Improving the availability and quality of small- and medium-scale infrastructure in order to strengthen livelihood opportunities and improve access to markets and social services. AKRSP interventions have reached approximately 135,000 households. A group of young women entrepreneurs who have set up bee-keeping, floriculture, dairy, retail businesses, supported by AKRSP through small grants. Local Support Organisations (LSOs) are central to the Aga Khan Rural Support Programme (AKRSP)’s approach to local participation and play an important role in planning and implementing rural development activities in agriculture, non-farm enterprise, employment, and infrastructure. They also help to mobilise matching funds from communities, which helps to ensure community ownership and sustainability of project activities. Zeban working in her green house - Aga Khan Rural Support Programme (AKRSP), Gilgit-Baltistan, Pakistan. The majority of households in Gilgit-Baltistan and Chitral remain dependent on agriculture for their income and the Aga Khan Rural Support Programme (AKRSP) has played a central role in increasing productivity and improving marketing of local produce. 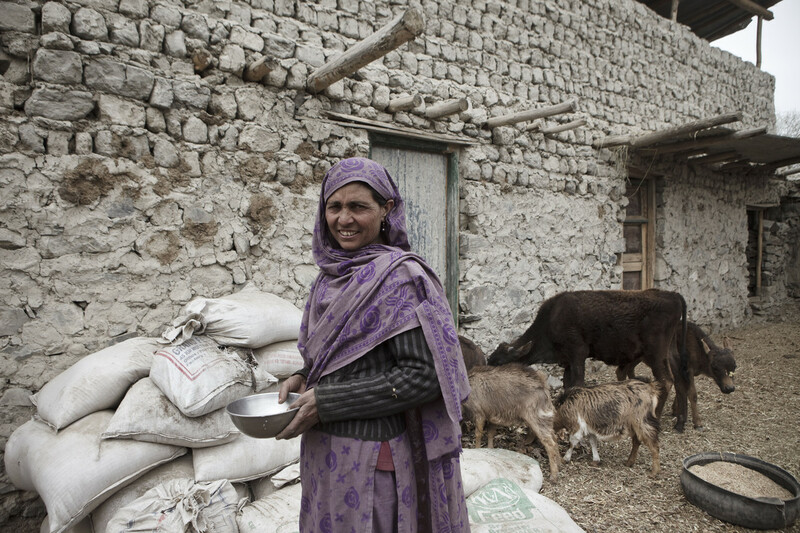 As a result of AKRSP, government and other development partners’ efforts, farm incomes in Gilgit-Baltistan and Chitral more than doubled between 2001 and 2008, while increased staple food crop production has resulted in greater food security for vulnerable populations. With funding from USAID, AKRSP is currently working with government and local partners to develop and implement the Satpara Development Project’s Irrigation Master Plan, primarily in Skardu district. Under this programme, AKRSP is working to improve the management of irrigation water through 149 water user associations. The programme will help farmers take advantage of more reliable irrigation water to diversify their agricultural production. AKRSP will also train farmers’ enterprise groups on new technologies and innovations, and will help them connect with markets and agro-processors to secure higher prices for their crops. Since intractable poverty remains a feature in the remote, mountainous programme area, AKRSP launched a livelihoods enhancement and protection programme in 2012. The initiative provides livestock packages, including training, to 662 particularly poor and vulnerable households and is supported by the Pakistan Poverty Alleviation Fund (PPAF).